Open Every Day from 7:30 a.m. until 11 p.m.
Come take a peek at our lovely Roanoke Island inn in Manteo, North Carolina. Cameron House is a historic accommodation built in 1919. All six rooms are uniquely decorated in the Arts and Crafts style that is a part of the laid-back island charm of the North Carolina Outer Banks. Relax in a rocking chair by the outdoor fireplace and let the quaint, peaceful spirit of small–town Manteo carry you back to a simpler time. A 1919 historic Arts and Crafts bungalow, Cameron House Inn is a unique treasure that we are happy to be able to share with others by restoring it as a bed & breakfast. This collection of pictures and comments is just a beginning to show you what our accommodations have to offer. Our bed and breakfast is a celebration of our love for this simple island life that still exists along the North Carolina Outer Banks in this small Roanoke Island community. We restored Cameron House Inn to its original Arts and Crafts character and furnished it to reflect the era in which it was built. Lounging in our rocking chairs by the outdoor fireplace or relaxing on the leather sofa with a great book, our bed & breakfast is filled with the spirit of a simpler time. All of our rooms and suites have been beautifully decorated to provide you with a feel that is relaxing and personal. Special care was taken to combine the grace of yesteryear’s island living with modern comforts you expect from a top-notch accommodation. We think you’ll love this place too. Guests frequently comment that the feel of peacefulness sets our inn apart from other accommodations. Everyone tells us that these images capture only a portion of the beauty and appeal our charming inn has to offer. You’ll have to travel to the Outer Banks and experience Cameron House Inn for the full picture. Cameron House Inn is also a perfect setting for the Outer Banks wedding you have been dreaming about. Our B&B provides services and packages that offer brides and grooms the perfect experience, whether that’s a simple event or an elegant Roanoke Island wedding – all the charm of Outer Banks beach weddings and none of the hassle. We are the perfect accommodations for guests in town for weddings. Our accommodations are also a great romantic getaway for your honeymoon or anniversary. Near Nags Head, Cape Hatteras and famous Outer Banks lighthouses, it is the ideal accommodation location for exploring the Outer Banks, the Roanoke Island attractions and enjoying the shops, restaurants and activities of Manteo. 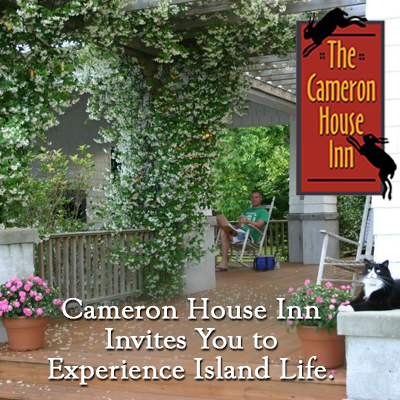 No matter what reason draws you to travel to the area – a family adventure to the beach, a romantic escape to an Outer Banks getaway or lodging for business travel – Manteo’s Cameron House Inn Bed & Breakfast is a premier Outer Banks accommodation that satisfies all your travel needs.